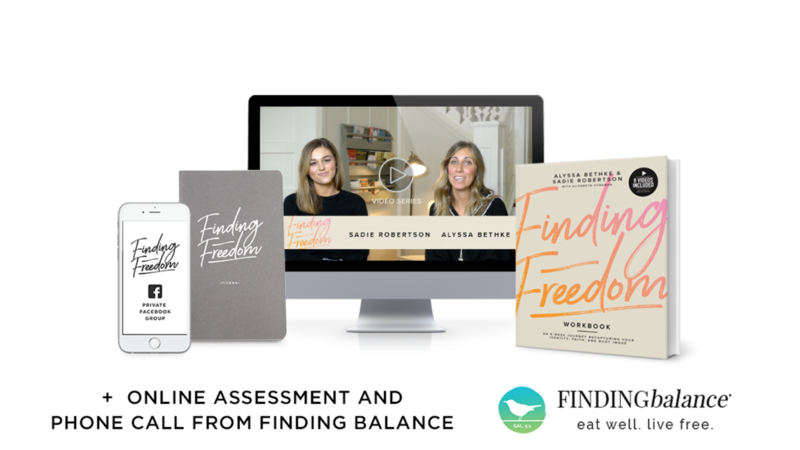 Join Alyssa Bethke and Sadie Robertson for an 8-week study on loosening the chains caused by the lies we tell ourselves. They share their personal stories of battling eating disorders and lies, coupled with the key truths and tools they used to find freedom. ***This workshop comes with everything in the $79 package plus a moleskin journal and 50 minute call with FINDINGbalance plus 3 online assessments. WHAT IS THE FINDING FREEDOM WORKSHOP? An online video course with workbook that is designed to uncover the lies you believe and replace them with God's truth. You will be given multiple, practical steps to find healing and freedom with body image, lies about food, and eating disorders. You will discover who God is and what that says about who you are, grow in Christ's likeness, truth, and freedom! Eight hope-filled and practical videos that will leave you with more freedom and joy. It will feel like a heart to heart coffee chat with Sadie and Alyssa as they take you on an active journey through scripture, bringing to light what God says about our bodies and minds as women. Experience the freedom of vulnerability and the joy of being understood in this eight-week journey in Scripture, with Bible study, prompt questions, and exercises. The workbook lays out the process Alyssa and Sadie used to find freedom. The journal will allow for more introspective reflection. All packages come with exclusive access to a private "Created to Be Free" Facebook group, hosted by our ministry partner FINDINGbalance and featuring LIVE Q & A's with Constance Rhodes and Angelica Gonzalez, LMHC, the experts you see at the end of each video. Atthe end of each video Constance Rhodes and Angelica Gonzalez, LMHC, from partner ministry FINDINGbalance, give tips to help support your recovery journey, including how to know if your relationship with food is unhealthy, what to look for in a counselor or nutritionist, and a weekly “next right step” you can take toward finding freedom. They’re also available to answer your questions LIVE each week on the Private Facebook Group page, where you can connect with others on a healing journey!